Valerie has one of these at her work, and she's wanted one for home for a long time. She's a tea drinker, and this machine makes great tea. So we decided to get one as an early Christmas gift--we've both got some time off over the holidays, and thought it would be nice to have during all the time we're going to have around the house. She's been using it, and then I tried it. I was a little skeptical at first. I'm picky about coffee. I use a French press at home normally--I can make a hell of a cup of coffee, but it takes a while. But you know, this makes really superb coffee! And it does it in seconds. It's like my new favorite thing. It came with about a dozen sample coffees, and I found several stout brews I really like. This thing will spit out a nearly perfect cup of coffee in less than a minute. Valerie has a basket for it that allows her to use her own teabags for coffee (or you can use your own fresh ground coffee too.) She made kind of an orange chai tea last night that was fabulous. 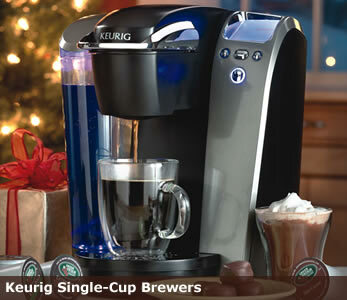 If you're looking for a gift for the coffee or tea drinker on your list, this would be a great gift. I don't know who's enjoying it more, Valerie or I.